Obstructive sleep apnea is a serious breathing problem that interrupts your sleep. If you think you have signs and symptoms of sleep apnea, you should see your doctor for a full exam and diagnosis. Your doctor can give you a test that will show whether you have sleep apnea. The best way to diagnose sleep apnea and other sleep problems is an overnight test in a sleep laboratory. 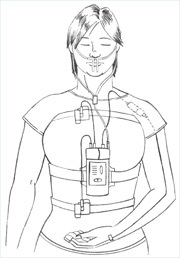 This test is called polysomnography (PSG). To get a polysomnography test, you go to a special sleep lab. A sleep specialist attaches small wires to your head, face, chest and legs. You will also have stretchy bands placed around your chest and stomach to record your breathing. The sleep specialist or tester may also use a video camera to record your sleeping position. Once you’re hooked up to the monitors, you fall asleep. You sleep the whole night in the lab. When your test is over, a sleep doctor will look at your results, make a diagnosis and suggest a treatment. The most comprehensive way to test for sleep apnea is polysomnography, a test that takes place overnight in a sleep lab. But there are long wait lists for polysomnography, so your doctor may consider giving you a different test for sleep apnea, using a portable home monitoring device. Doctors use portable home monitoring devices in cases where they are fairly sure the patient has sleep apnea. Doctors ten not to use offer home monitoring to patients with other serious respiratory or cardiac problems – those patients should take the polysomnography test. A woman wearing a home monitoring device, which helps diagnose sleep apnea. By taking a home monitoring test, you can avoid the long wait for polysomnography. This means you can start your treatment sooner. Portable home monitoring devices measure your oxygen levels, the airflow through your nose and mouth, your breathing patterns and snoring. Your doctor or another health-care provider will show you how to hook up the machine and explain how it works. Then you’ll bring it home, put it on and wear it overnight as you sleep at home, in your own bed. The machine will keep track of your results. Later a doctor will read your results, diagnose your problem and recommend a treatment. This content was reviewed on October 15th, 2014 by The Canadian Thoracic Society’s Sleep Disordered Breathing Clinical Assembly.